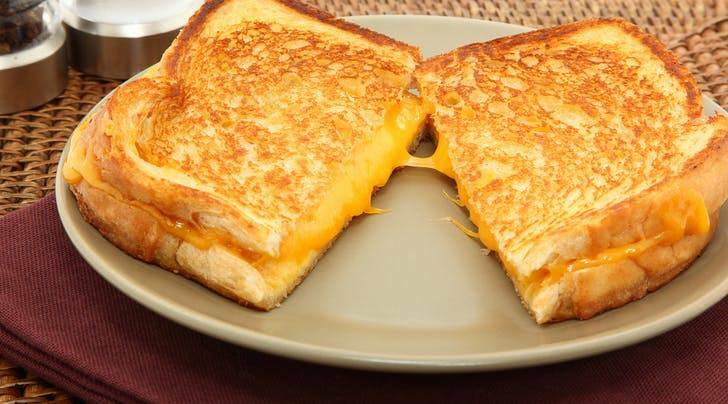 Skip the Butter and Use This on Your Grilled Cheese Instead ! Just when I thought it couldn’t get any better, I found this amazing trick that takes a basic grilled cheese to the next level. What you need: A nonstick pan, bread, cheese and--wait for it--a few teaspoons of mayonnaise. What you do: Put the pan over low heat. Here’s where you would typically drop in a chunk of butter, but skip that altogether. (Trust me on this one.) Instead, spread two slices of bread with an even coat of mayo. Place one slice in the pan, mayo side down. Top it with your cheese of choice. Then add the other slice of bread, mayo side up. Let it cook for a few minutes until the bottom is golden brown. Flip and cook on the other side. Why it works: Mayo spreads better than butter does (crucial when you’re using a softer bread like brioche) and has a higher smoke point (meaning it won’t burn as easily). Plus, the oil and egg in mayonnaise brown nicely and add a creamy flavor to the crust. You’re welcome.